Offer not valid on previously purchased tickets and may not be combined with any other offer. All sales final. Blackout dates and other restrictions may apply. Phone and Internet orders are subject to standard service fees. Offer may be revoked without notice. Offer is valid through 6/30/19. The biggest thing in Shakespeare is coming to NYC! Be among the first to experience this groundbreaking project… A festival of 39 readings of new translations of Shakespeare’s plays into contemporary modern English. 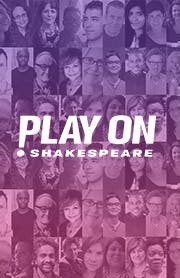 In 2015, the esteemed Oregon Shakespeare Festival launched the commissioning project, Play On!, and together they tasked some of today's most exciting playwrights—more than half of whom are women and playwrights of color—to translate Shakespeare’s cannon. See just one, or see all 39, but don’t miss this watershed event in theater history.